X-Large - $80.99 Only 5 left! Get together with Big Bird for a fun night out in this adult Elmo costume! The Sesame Street costume includes a red, plush shirt that is made from polyester. The shirt has long sleeves lined with elastic at the cuffs. Elastic also lines the bottom and the shirt velcros in the back for closure. 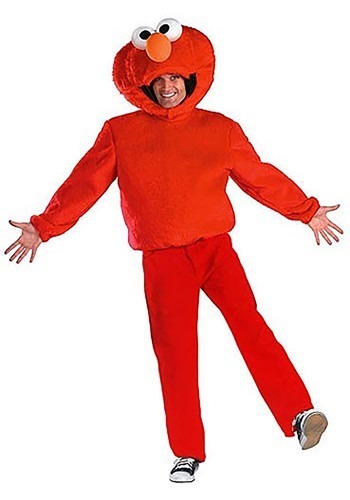 The over-sized, plush headpiece includes Elmo's signature smile with large eyes and an orange nose. The headpiece has a large opening for your face and velcros under the chin to secure it in place. Be sure to check out all of our Sesame Street costumes like the Cookie Monster and Oscar the Grouch!